How and what we say affects what we believe. I saw this in my research for The Jesus Gap, which found that 73% of the language used by high school students to answer the question, “Who is Jesus?” was creedal in origin. I was further convinced of this through Amanda Drury’s fantastic book, Saying is Believing: The Necessity of Testimony in Adolescent Spiritual Development. 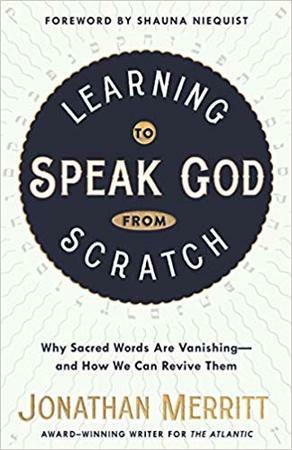 Because of this, I was excited to read Jonathan Merritt’s new book, Learning to Speak God from Scratch: Why Sacred Words are Vanishing and How We Can Revive Them. Ever since I began reading Learning to Speak God from Scratch, I’ve been excitedly talking about this book with people. This book is important. As Jonathan says, “When we lose our spiritual vocabulary, we lose much more than words. We lose the power of speaking grace, forgiveness, love and justice over others.” In Learning to Speak God from Scratch, Jonathan has written a book that will help us understand the power of words and in the process, reclaim them so that we can indeed speak grace, forgiveness, love and justice over ourselves and others. Disclosure: I received a free copy of Learning to Speak God from Scratch from Convergent Books in exchange for a fair and honest review.